Recently the World Bank’s November issue of the biannual Russian Economic Report came out. At the time I was busy with other things, amongst others planning the move from Blogger to self-hosted WordPress; as such, I did not give it the comprehensive treatment that it deserved at the time. Of course, reading about these things today is much more important than at any time since 1998 (or 1987, or even 1929)…and if I devoted an entire post to the last November issue, surely this new compendium of graphs galore and pecuniary palaver deserves some special attention? It was compiled with a keen eye to the unfolding global economic crisis, and as such is up-to-date and covers the entire period up to October 2008. We will focus on the first section, which is a comprehensive account of Russia’s economic position. (Part II, Anatomy of the Crisis, is an in-depth discussion of the causes and progression of the credit crisis with particular attention to Russia; I will cover this in a follow-up post, so that this one doesn’t become a bigger monster than it already is). My aim is to provide a succinct summary of the data, a readable summation of its main arguments and my own contextualization, especially relative to other countries and more recent (bad) economic news. In summary, an incipient slowdown in the Russian economy was turbocharged into nosediving growth rates by the credit crisis. Russian companies are finding it difficult to access credit, while having to pay off a slew of short-term external loans. However, most of them are due in the final two quarters of 2008, so in this respect the situation should improve next year. The liquidity crunch in September was controlled in a ‘swift, appropriate, and proportionate’ by the government, which now plans on substantial counter-cyclical fiscal injections to limit the effect of the credit crunch on the economy. The inflation risks of doing so have receded due to the global deflationary forces, while long-term fiscal viability is not seriously threatened, even under an erroneous scenario of continuing low oil prices, because Russia has healthy reserves and the non-oil part of its budget runs a small deficit. Although the capital account will go into the red to the tune of 100bn $ in 2009, the current account will remain positive at 40bn $ and the Central Bank should not lose more than 100bn $ in reserves in that year – considering that today they stand at 450bn $, this is far from catastrophic. Recent economic news indicate that Russia, along with much of the rest of the world, is in much worse straits than was the conventional wisdom even a month ago, when this report was compiled – for instance, it is very likely that it’s already in a full-blown recession. Nonetheless, as I calculate below, even in a very pessimistic scenario in which oil prices fall to 50$ for 2009, the current account deficit for the year should not much exceed 40bn $; similarly, even a total cessation of net oil transfers to state coffers in 2008 will not imperial Russia’s long-term fiscal sustainability. So is Russia going to go red? On the capital account, yes; on the current account, almost certainly not unless there’s a full-blown global Depression and complete collapse of oil prices; on government spending, almost certainly not unless oil prices completely collapse or the Russian economy and tax base implode, both of which I consider extreme outliers on the probability scale. (However, the state will become more “red” in the political sense, because at least in the medium-term, it will assume more control over economic life and spend more on strategic long-term investments and social welfare – in any case, there have been latent tendencies towards the above in the last couple of years, anyway). Nonetheless, one should take the doom-laden prognostications of political instability, and perhaps bloody revolution, made by the likes of Streetwise Professor with a pinch of salt – the populist discourse on red-in-tooth-and-claw silovik “clans” fighting for “resource rents” which hold the “natural state” together might appear superficially attractive, but is in fact meretricious, intellectually vapid verbiage that betrays the author’s preference for the mysticisms of Kremlinology over hardheaded observation and analysis of real economic data. After a decade of high growth (7% for 1999-2007) and an overheated acceleration to 8% in the first half of 2008, the economy began to decelerate. During the incipient stage of the world financial crisis, Russia was widely viewed as a safe haven due to its strong macroeconomic fundamentals (low sovereign external debt, big twin surpluses and impressive foreign currency reserves). This helped Russia delay the impact of the global credit crisis – “it is now clear that if Russia had not entered the current global financial crisis with such a strong fiscal surplus and large resources accumulated in the stabilization funds and foreign reserves, the impact of the crisis would have been much quicker and more severe than is currently the case”. A slew of shocks transmitted the global financial crisis to Russia: they are, a) a reversal of capital flows due to the global flight away from emerging markets to ‘quality’, b) liquidity problems amidst short-term external repayment obligations, c) the tumbling oil price, which eroded Russia’s fiscal and current account surpluses and reserves and d) the collapse of its stockmarket. These shocks slowed domestic demand, Russia’s main driver of growth. On the supply side, tradable sectors were the first to register slower growth, but nontradables are also slowing from very high growth rates. This is happening amidst a background of increased borrowing costs (adversely affecting liquidity and credit) and slowing aggregate demand (affecting consumption and investment). Incipient signs of the latter were already being felt as early as Q2, when consumption growth slowed to 13.0% from 19.1% in Q1, and fell further to 9.9% in Q3, and investment slowed due to uncertainties about the world economy. The report repeats a criticism of the Russian economy that it frequently makes, that investment is heavily concentrated in a few, mainly nontradable sectors (resource extraction and in the transport and communication category, out of which pipeline transport accounted for a significant part) and 22% share of investment in the GDP, which is low by the standards of the east Asian tigers. In the nine months of 2008, Russia began to experience a globally incited “sudden stop” and a reversal of capital flows, followed by a rapid fall in oil prices—but the current account has held well. Despite rapid import growth driven by strong domestic demand, trade and the overall external current account continued to improve on the back of record high oil prices. The fall in oil prices will significantly affect the trade and external current accounts only in Q4 of 2008, when export deliveries based on past lower oil price will take place. More worrisome, however, is that the nonoil external current account continues to deteriorate quickly in 2008 as import volumes grow considerably faster than nonoil exports. In Q2 of 2008, the nonoil external current account deficit sharply increased to almost USD60 billion, and further to USD62 billion in Q3, making Russia’s balance of payments position particularly vulnerable to a sudden drop in oil and gas prices. (NOTE: However, it is not critical, as could be gleaned from Russia’s balance of payments for H1 2008 and a few quick and crude calculations. Goods imports of 135bn $ were countered by oil/gas exports of 159bn $ and other goods exports of 78bn $, and add a deficit in services trade of 11bn $. Assuming everything remains constant except the value of the oil/gas exports* means that we need ((135+11-78) * 2 = 136bn $) in the latter to retain a positive current account. (* In practice, the value of Russia’s other exports will also decline because most of them are commodities like metals, lumber and grain; on the other hand, imports will certainly fall too due to global deflationary forces, a weakening ruble and falling consumer demand, thus presumably cancelling these effects out.) Even assuming a pessimistic oil price of 50$ per barrel for 2009 (in practice, most economists think it will be around 70-80$, albeit there is currently a downward tendency to revisions), that would simply take us back to 2005, when the average was 50.04$ (or 54.99$ inflation-adjusted). In that year, Russia exported 148bn $ of oil/gas (nor will export volumes change much between 2005 and 2009). Thus, even in this ‘low’ scenario we get a current account surplus of 12bn $ – and even if we undershoot, there still the matter of Russia’s 450bn $ reserves as of November. From this I’d venture to say Russia has ample resources to pursue a gradual correction, rather than sudden devaluation, of the ruble; and to undertake serious counter-cyclical fiscal measures. But more on that later…). After record inflows in 2007, Russia has experienced a sudden reversal in capital inflows since mid-year. After reaching a peak 84.3bn $ in 2007, the capital account surplus fell to just 0.5bn for the first three quarters of 2008, due to a sudden reversal in Q3. It also reflected much slower accumulation of reserves of official reserves in 2008 relative to the previous year, despite a much stronger current account. This was due to changes in investment sentiment and changes in foreign exchange expectations that had previously bet on further ruble appreciation. In 2008, capital flows became more volatile, and the banking sector experienced a sharp reversal of capital inflows. Foreign direct investment—non-debt-creating capital flows that can also bring new technology and knowhow—registered a decline due to changes in domestic laws and investor sentiment. Look into the report for greater detail into the structure of Russia’s capital account and reasons behind the fall and restructuring of FDI. The decline in FDI was partly offset by greater reliance on external borrowing. This made the capital account more vulnerable to changes in investor confidence and borrowing and refinancing conditions. While the overall share of short-term external debt of Russia remains low, accounting for less than 20% of total external debt, the share of short-term debt in private financial institutions is significantly higher at around 40%. Many smaller banks with weak deposit bases are going to struggle with the higher borrowing costs and sharply increased rollover risk, although a positive effect would be to encourage consolidation in Russia’s fragmented banking system. 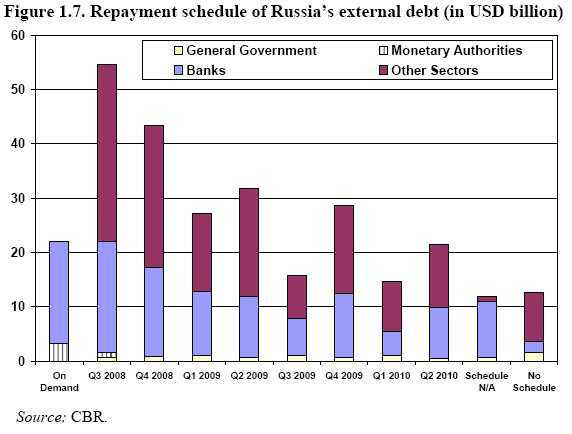 Russia’s external debt maturing in the final two quarters of 2008 is 120bn $, while the amount requiring repaying or refinancing for the whole of 2009 is less than 100bn $. Rolling over debt is going to be tough, especially for smaller private institutions, due to higher refinancing prices and drops in stock that could otherwise have been used as collateral. However, systematic risk remains limited because of the government’s resolve to support the systemically important banks and a sizable package of measures taken to date. The central bank has gradually begun to change its policy of exchange rate switching towards inflation targeting, making the exchange rate more flexible. Monetary tightening, like raising reserve requirements and interest rates, reduced money supply growth from 27.8% to 8.3% in the first three quarters of 2007 and 2008, respectively – albeit not enough to rein in inflation driven by high inflation expectations and high aggregate demand. But with liquidity risks rising sharply, the central bank moved decisively to support liquidity in the system and help restore confidence during the September liquidity crunch. Dramatic worsening of global financial conditions in the third quarter of 2008 and the liquidity crisis in September caused the central bank to change the policy course and provide substantial liquidity in its efforts to alleviate the confidence crisis and unfreeze the interbank credit market. These actions were swift, appropriate, and proportionate to the problem at hand. And they helped to temporarily stabilize the financial markets after the tumultuous week of 15-19 September. An estimated 400 billion rubles of additional liquidity (15bn $ or 1.2%t of GDP) were pumped into the economy in September and October, when the reserve requirements were dropped sharply to 0.5 percent. This temporarily alleviated the sharp liquidity and confidence crisis in mid-September, but liquidity pressures continued later in October and prompted the government to take additional measures to ensure the rollover of external obligations by banks and corporations (again see below). In hindsight, this was the right decision, helping avoid more difficult liquidity conditions in September and early October than otherwise. Inflationary expectations, higher import prices, combined with loose monetary and fiscal policy in 2007 and early in 2008 have resulted in an upturn in CPI inflation, which reached 11.6 percent in the first ten months of 2008. Slowing growth and aggregate demand should alleviate these pressures, albeit not enough to meet the government’s 11.8% target for 2008 – the Central Bank recently revised its year-end CPI inflation target to 13%. Russia’s consolidated (general) budget was executed with the strong surplus of 11.1% of GDP in the first nine months of 2008, compared with 9.4% for the same period in 2007, mostly due to higher revenues from sky-high oil prices. However, according to preliminary data from the Ministry of Finance, the consolidated non-oil balance amounted to -0.2% of GDP, compared with about 0.7% surplus last year. Given the seasonality in expenditures, a sharp fall in oil and gas prices—and the recently announced increases in government spending to weather the impact of the global financial crisis—the fiscal position is expected to deteriorate toward year-end, with the non-oil deficit possibly exceeding the last year’s -2.9% of GDP. The report argues that given the risks to the financial system and the real economy, such a red-shift (ha!) is justified in the short-term; albeit if energy prices stabilize at the current low level, long-term expenditures must be adjusted to ensure fiscal sustainability. After discussing details of the Russian 2008-2010 federal budget, the report goes on to confirm my support for a loosening of the fiscal policy stance, since ‘counter-cyclical fiscal policy has a better chance of affecting the real economy when there is a sizeable fiscal surplus, as in Russia, as opposed to when additional public debt might risk aggravating the underlying fiscal problems’. Russia’s first challenge is to limit the overall impact of the crisis on liquidity and the real economy while not losing control of the public finances and not letting inflation get out of control. 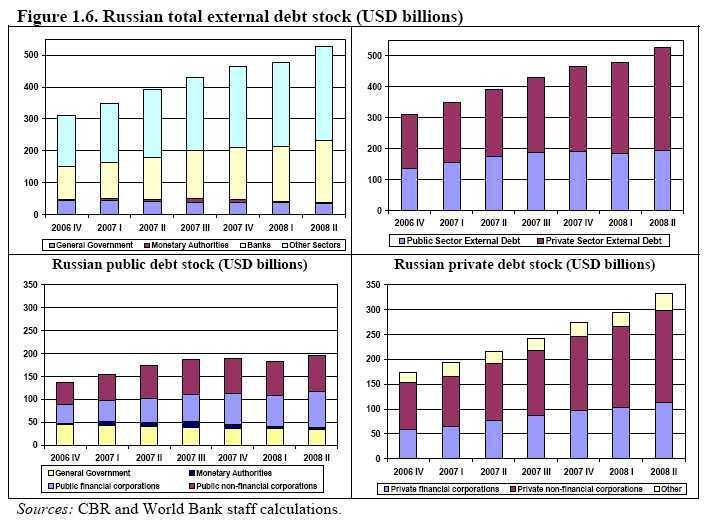 Although a delicate balancing act, in contrast to itself in 2008 and many other emerging markets today, Russia has strong macroeconomic fundamentals (huge reserves, budget and current account surpluses, a ratio of external short-term debt to total international reserves of around 0.18 (Q2) and a fairly low overall external debt of 35.9 percent of GDP) and its policy response so far has been ‘swift, massive, and broadly appropriate’. The second challenge is to intensify the efforts to diversify the economy, strengthen institutions as well as the financial sector for sustained, long-term growth. A lot of standard platitudes about the need to diversify the economy, strengthen the financial sector and pursue structural and institutional reforms. the acceleration of accession to the WTO. Globalization and rule-based international frameworks and yadda yadda are great! (Not that I disagree, but first Washington has to let Russia into the WTO). The fourth challenge is to limit the impact of the crisis at the regional level and be vigilant to the emergence of non-payment problems. Due to problems with obtaining credit, regions that rely on narrow tax bases or engaged in deficit spending may undergo problems, and recommendations on dealing with said problems. increases and targeted tax cuts) to unlock investment and boost flagging aggregate demand. More platitudes on the need for transparency and due attention to moral hazard. The report emphasizes the global financial outlook is very much uncertain and could have wholly unforeseen ramifications. Their key assumptions are oil prices and world GDP growth of 101.5$ and 2.48% in 2008, and 74.5$ and 0.93% in 2009, respectively; and impacts on the Russian economy and policy responses so far. Thus, Russian growth is projected to be 6% in 2008 and 3% in 2009 (down from 6.5% pre-crisis), while employment will increase from 5.3% to 5.9% by year-end. (NOTE: as previously pointed out, it appears that Russia is already in recession (Edward Huge notes that PMI for both services and manufacturing below 50 in October), employment for that month already up to 6.1% and very gloomy figures for November manufactuing). Twin surpluses (federal fiscal and external current account) will substantially decline and capital account deficit would widen with further capital outflows. Federal fiscal surplus in 2008 would likely remain within 3.5% of GDP range but could decrease further in 2009, reflecting lower oil export revenues and additional public expenditures now under consideration. Current account surplus would be around 100bn $ in 2008 and about 40bn $ in 2009. Capital account would deteriorate in 2008 to about 50bn $ and then to 100bn $ in 2009, largely reflecting the repayment obligations and the lack of large new FDIs or portfolio investments until the global crisis nears the end. The attendant impact on CBR reserves should be limited to a possible loss of no more than additional 100bn $ in 2009, including the announced policy interventions in support of the banking and corporate sectors. As for the summary…well, see the first six paragraphs. I’m not going to repeat anything, except to remind you that I plan to make another post on the WB Report, this time on its second part, Anatomy of the Crisis.